Turkey is a popular destination for birders and tourists, and although there has been much published on its birds over the past 40 years, there has never been a comprehensive avifauna. The Birds of Turkey redresses this and it contains a detailed account of every species on the Turkish list, with a full breakdown of records and status, distribution in Turkey, and taxonomy. There are also authoritative introductory chapters on geography, climate, habitats, history of ornithology and conservation. 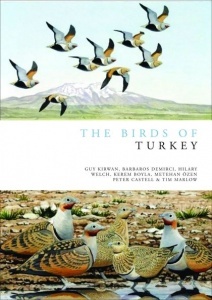 Guy Kirwan (the senior author) has travelled extensively in Turkey over many years and has published many papers on its birds. He is also the editor of the Turkey Bird Report and the former editor of OSME's journal, Sandgrouse.